Today, you travel to Columbus, OH for an overnight stay. Dinner this evening is included a conveniently located restaurant. Following dinner with a guide on your bus, you enjoy a 90 minute tour of Columbus Landmarks and Favorite Haunts. Ghost stories set against the architectural background where they took place. Old watering holes, a literary house, a bed and breakfast, a Victorian mansion, a final resting place, and a city park, there are several eerie stories waiting for you. Arriving in Louisville, KY early afternoon you first visit Indiana Caverns. Here 110 feet underground you enjoy a cruise. Then ride the Louisville Mega Cavern Tram Tour that twists and turns through part of 17 miles of underground passageways beneath the city of Louisville. 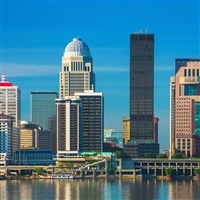 You will then check into the Louisville Crowne Plaza for a three night stay. Following hotel check-in, this evening's 6:00 pm event promises to be great fun. The Phantom's Masquerade is a costume party and gala dinner at Louisville's oldest theater, the Municipal Auditorium. Masks and disguises are encouraged (not required) to build the enthusiasm and provide visual excitement. On arrival, you will be escorted to your dinner tables located in various rooms throughout the theater. Strolling musicians, Phantom Violinists and Gypsy Dancers will provide entertainment during the meal. A cash bar will also be available. At the conclusion of dinner, you enter an acoustically perfect theater. One of the most remarkable concert halls in America, it is home to the world's largest Pilcher Pipe Organ with more than 5200 pipes. It provides a rich unequalled sound that will fill the room with the drama and passion as you watch the original 1925 silent movie "The Phantom of The Opera" starring Lon Chaney, with the theater's Master Organist playing the original score. Today, you explore the Suburban Bourbon Trail; the most famous brands of bourbon call Kentucky home. Visit two suburban Louisville Distilleries and learn about the history of bourbon in Kentucky, the distillery process and enjoy a tasting. At 5:30 pm, gather in the Crowne Plaza Ballroom for a rock n' roll, trick-or-treat dinner show. The menu is filled with ghoulish delights, a plated meal with salad, entree and vegetables ending with a nice slice of Jack O-Lantern Pie for dessert. Dinner is followed by an hour of live music from the costumed "Crypt-Kicker Five" who perform rock songs from the 60's and 70's and will have a couple of Halloween numbers ready for you. After dinner and the first music set, you depart for Louisville's Iroquois Park and stroll through the Jack-O-Lantern Spectacular. Country Living magazine called it the "#1 Halloween Event in the Country" and it may well be the highlight of your tour. There are 5,000 carved and illuminated pumpkins along a 1,500 foot promenade through the park.It's a veritable light show; just imagine the flickering glow from magical displays depicting people, places and scenes, a menagerie from popular culture to old-time favorites and everything in between - all Jack O-Lanterns are completed in painstaking minute detail. The displays are accompanied by music and docents to help you along - it's both an Artistic and Organic Halloween Gallery like you've never seen before. At the conclusion of the tour, you return to the Crown Plaza where goodness gracious sakes alive, there's more dancing tonight with "The Crypt-Kicker Five." You start the day with the Louisville Slugger Museum's fascinating interactive exhibits, with a box lunch included. Then tour the Muhammad Ali Museum; it's a truly fascinating, high tech display presenting the life of an athlete and a man of conviction. Tonight's Special Event is "The Headless Horseman's Holiday Party."  You will be treated to a haunted tour of Churchill Downs; where perhaps the Horseman may be riding around. This is a behind-the-scenes and beyond-reality tour. It's like time travel to meet the spirits on the dark side of the track. You hear the legends and lore of both the supernatural and the spooktacular. Visit the Kentucky Derby Museum's Cemetery and climb to the sixth floor of Churchill Downs (elevators available), where between the twin spires of the world's most famous Racetrack you learn about her ghosts. Dinner is included at food stations scattered throughout The Kentucky Derby Museum. You will find the building is uniquely decorated and filled with a variety of friendly Spirits. There will be Fortune Tellers, Gypsies, and Wicked Creatures, scattered among the exhibits. There are acrobatic ghosts and witches flying across the ceiling, plus a devilish DJ with a festive Dance Floor playing Halloween Songs and Videos - everything from "The Monster Mash," to Bette Midler's "Hocus Pocus" and the Rolling Stone's "Sympathy for the Devil." It's a spellbinding evening of haunting humor, laughs and lunacy, music and madness. It's the Horseman's annual gathering, a ghoulish, galloping, good time event. After breakfast at the hotel, you depart Louisville and travel to Wheeling, WV for the night. Dinner is included at a local restaurant this evening. This morning you depart for home following breakfast.